We didn’t need a weather app to tell us that in many parts of Australia this week it was cold. We just had to look to the #everydaystyle feed on Instagram. Unseasonably early winter weather descended even on Brisbane. I embraced it by ceremoniously moving my high summer clothes into the spare wardrobe, switching out and moving in my winter clothes ready for high rotation in the coming months. If you have the luxury of a spare wardrobe – and distinct seasons – this is such a good way to manage your clothes. What I like most about this set-up is that when I do the seasonal switch it means I go through the entire collection, piece by piece. It reminds me what I do already own. I love re-discovering past wardrobe friends ready for re-working again this season. This is particularly the case for my winter wardrobe. So many key pieces I’ve had for years. They’ve stood the test of time and haven’t worn out because the season is so short. I also marked the arrival of winter by embracing my scarf collection. The winter scarf collection. And you did too. There was so much scarf-wearing inspiration in #everydaystyle this week that I decided to focus on that for this week’s round-up theme. The how to wear a scarf question is one I get asked about a lot. This post from the SY Vault includes video tips on how I most wear my scarves in winter. 1. A simple drape around the neck, letting both ends fall down to elongate my torso. This a great for when days aren’t cold but I want a scarf to add an extra something, accessories-wise to an outfit. 2. A wrap at the front of the neck through to the back with the scarf ends brought back around to the front. I then adjust where the scarf sits depending on the weather – flush up against my neck if it’s cold. Away from my neck if it’s not so cold. It’s a personal thing and also a weather thing for me. The colder the day, the more I want to wrap a scarf around my neck. Scarves without too much bulky fabric work best for me – my neck is not super long and I have a D-size bust so adding bulk around my chest and neck tends to throw my shape out of proportion. I don’t mind some draping action in a scarf but for a scarf to drape in a flattering way the fabric has to drape easily and not be too bulky. The one I’m wearing below is ideal for me – it’s a fine wool so easy to work into a wrap and drape and also just as suitable for wearing loose hanging around my neck. Take a look at all this scarf-wearing action. We’ve got drapes, we’ve got wrapping, tying and looping. We’ve even got a token male getting in on the scarf action (thanks Dean!). No matter how you choose to wear a scarf, the key thing to take away from this post is to embrace them as part of your wardrobe. Look at the outfits below. Imagine them without the scarf. The scarf is just one accessory but it immediately lifts an outfit to another level. It pulls the outfit together, tying in outfit colours or adding a pop of colour and it creates a focal point for your outfit. A focal point near your face. Want to join in? Simply upload a photo of yourself showing your everyday style to Instagram or Facebook, use the #everydaystyle and tag @stylingyou so I can find you. Don’t feel you have to post every day. Post when you can. For consideration in my outfit of the week round up, I look first for clear, in-focus photos without text or borders on them. These work in best with the montage layout. Check out Wardrobe Wednesday with Kim-Marie on Kimba Likes. Over 30? 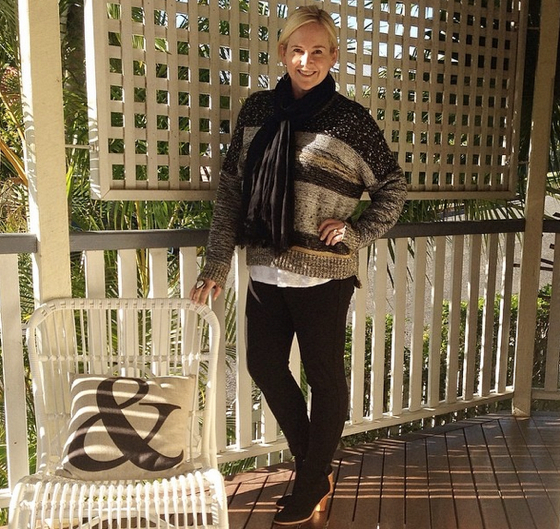 Rach from Redcliffe Style links up with other style bloggers each Thursday for 30+ Style. How was your everyday style this week? Do you love a scarf? Find it tricky to wear or find one to suit? I have a beautiful navy and gold cashmere scarf from Europe. It is quite large and I am petite. How can I wear it without being drowned by it. Is it a square or a rectangle? If square, can you fold it into a long rectangle and tie from there? If rectangle, then use more as a wrap than a scarf. I’ve noticed that Bec – also good when the baby arrives as well. Always found them better than necklaces which were easily pulled and broken! 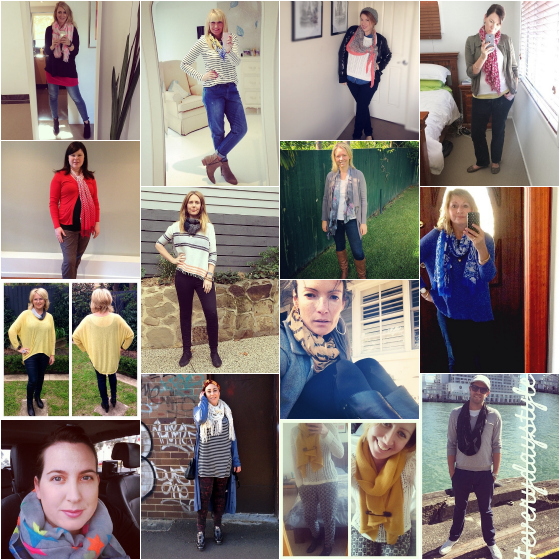 Love the way the ladies are rocking their scarves! I am rocking my most fave scarf today – a huge Trent Nathan black and tan leopard print lightweight knit scarf. It’s keeping my sore throat warm against this chilly Adelaide day. Wrap me up! Nikki, I spent yesterday sorting winter and summer clothes and the scarves are ready for outings. Have you seen this wonderful video? It shows scarf styling and it is done so beautifully. I have and it does Elizabeth – Google and YouTube are a gold mine of ideas! I love what she does and it’s such a lovely video. thankyou nikki! … sister scarf spert here! … 1 million scarves and still counting … only a slight exaggeration! I am a scarf lover from way back. every type of scarf imaginable they all work their wonders for me! a soft bit of drapery around the neck … yes pleeese! also when I travel, I always buy another ‘must have’ one! Can never have too many scarves I say Merilyn! Gosh I’m feeling loved this week! Thanks for including me (and my Wardrobe Wednesday fashion linky party!). The scarf I am wearing is a vintage crocheted shawl I use as a sofa throw which I grabbed one cold (and late!) morning.